Physicists at the U.S. Department of Energy’s (DOE) Princeton Plasma Physics Laboratory (PPPL) have found a way to prevent plasma — the hot, charged state of matter composed of free electrons and atomic nuclei — from causing short circuits in machines such as spacecraft thrusters, radar amplifiers, and particle accelerators. In findings published online in the Journal of Applied Physics, Charles Swanson and Igor Kaganovich report that applying microscopic structures that resemble feathers and whiskers to the surfaces inside these machines keeps them operating at peak performance. The physicists calculated that tiny fibers called “fractals,” because they look the same when viewed at different scales, can trap electrons dislodged from the interior surfaces by other electrons zooming in from the plasma. Researchers refer to the dislodged surface electrons as “secondary electron emissions” (SEE); trapping them prevents such particles from causing electric current that interferes with the functions of machines. This work builds on previous experiments showing that surfaces with fibered textures can reduce the amount of secondary electron emission. Past research has indicated that surfaces with plain fibers called “velvet” that lack feather-like branches can prevent about 50 percent of the secondary electrons from escaping into the plasma. The velvet only traps half of such electrons, since if the electrons from the plasma strike the fibers at a shallow angle the secondary electrons can bounce away without obstruction. The new research shows that feathered fibers can capture secondary electrons produced by the electrons that approach from a shallow angle. As a result, the fractal fibers can reduce secondary electron emission by up to 80 percent. The two scientists now have a provisional patent on the feathered-texture technique. This research was funded by the Air Force Office of Scientific Research, and follows similar experimental work done at PPPL by other physicists. Specifically, Yevgeny Raitses, working at PPPL; Marlene Patino, a graduate student at the University of California, Los Angeles; and Angela Capece, a professor at the College of New Jersey, have in the past year published experimental findings on how secondary electron emission is affected by different wall materials and structures, based on research they did at PPPL. Rich Hawryluk has been appointed interim director of the U.S. Department of Energy’s (DOE) Princeton Plasma Physics Laboratory (PPPL) while an international search for a permanent director moves forward, Princeton University Vice President for PPPL David McComas announced recently. Hawryluk, who has been heading the NSTX-U Recovery Project, is an internationally-known physicist and a former deputy director of PPPL. “Rich has earned my highest respect and the respect of his colleagues and staff at PPPL and of researchers throughout the world for his work as a scientist, project manager, and leader. I am delighted he has agreed to head the Laboratory as we move into the next phase of the NSTX-U recovery,” McComas said. Terry Brog, who served as interim director since September 2016, will return to his previous position as deputy director for operations and chief operating officer that he assumed in June of 2016. Stacia Zelick, who served as interim deputy director for operations under Brog, will continue to serve in a leadership role. Michael Zarnstorff, the deputy director for research, will remain in his position. Physicists Jon Menard, head of NSTX-U research and Stefan Gerhardt, deputy engineering director for the project, will now lead the NSTX-U Recovery Project. Charles Neumeyer will remain as the NSTX-U Recovery Project engineering director and deputy head of engineering for NSTX-U. The leadership change comes as PPPL moves ahead with constructing prototype magnets in preparation for replacing the one that failed last year and five others that were built under similar conditions. 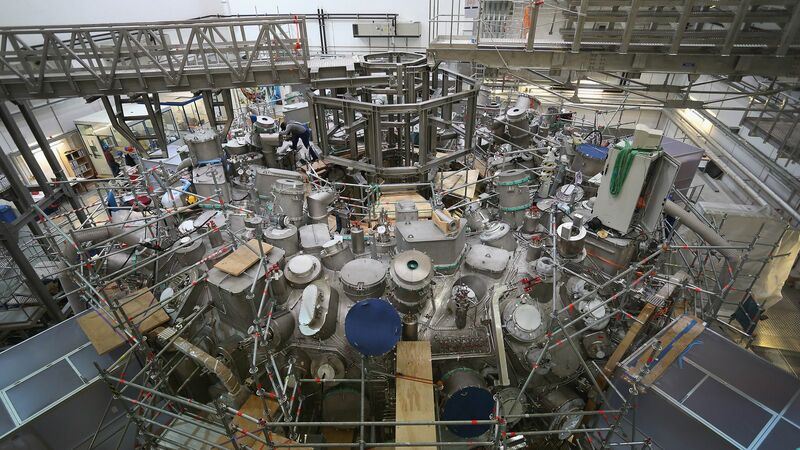 Construction of the first prototype magnet follows a comprehensive review of each system of NSTX-U by a team of engineers and scientists from PPPL as well as nearly 50 external experts from the United States and around the world. The new interim director has been at PPPL for most of his career. He came to PPPL in 1974 after receiving a Ph.D. in physics from MIT. He headed the Tokamak Fusion Test Reactor, then the largest magnetic confinement fusion facility in the United States, from 1991 to 1997. Hawryluk oversaw all research and technical operations as deputy director of the Laboratory for 11 years from 1997 to 2008. He was then head of PPPL’s ITER and Tokamaks Department from 2009 to 2011. From 2011 to 2013, Hawryluk worked at ITER in France, serving as the deputy director-general for the Administration Department of ITER. In 2013, Hawryluk returned to the Laboratory as head of the ITER and Tokamaks department. He remained in that position until he became head of the Recovery Project last year. Hawryluk has received numerous awards during his career including a Department of Energy Distinguished Associate Award, a Kaul Foundation Prize for Excellence in Plasma Physics Research and Technology, a Fusion Power Award, and an American Physical Society Prize for Excellence in Plasma Physicswith physicists Rob Goldston and James Strachan. A fellow of the American Association for the Advancement of Science since 2008 and of the American Physical Society since 1986, he also chairs the board of editors of Nuclear Fusion, a monthly journal devoted to controlled fusion energy. Hawryluk and his wife Mary Katherine Hawryluk, a school psychologist working with special needs children at the New Road School in Parlin, New Jersey, met as undergraduates and have been married for 41 years. They have two grown sons: Kevin, who lives in Chicago, and David, who lives in Los Angeles. In his spare time, Hawryluk is an avid reader.